Gargi Kapoor is the only one convinced her brother, Dev is innocent of the crime he was convicted of. When he is sent to the hospital with an unexpected paralyzing disease she finds herself having to lean on the last person she’d ever want to depend on a man who wants her brother to pay for stealing his mother’s life savings. Parker J. Cole written a wonderful Christian Romance Story, “Time To Say Goodbye – A Michigan Sweet Romance”. Parker J. Cole created a story about a culture that’s different from her own can be challenging but she successfully put the story and characters well-developed. I applaud her for taking the risk of creating a Christian story from a different culture that isn’t her. She actually proven to the readers that she is a great writer with creative mindset. 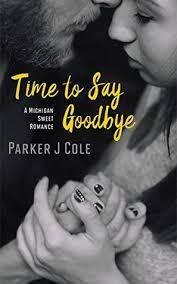 “Time to Say Goodbye”, by Parker J. Cole, is the first book that I read in the Michigan Sweet Romance series. All of the typical basis of her stunning books are present – characters that you have appreciation for, a plot that keeps you turning the page, and a conclusion that makes you long for more.The narrative starts off like every other Parker J. Cole’s novel – she draw you from your satisfying position on the couch and immerses you in the scenery, the characters, and the story. The readers can imagine as if they were there with Gargi as she walked into the prison to meet her brother, and they will remain there with her until the very end. Her characters always are so well developed. You will fall in love with the blossom chemistry between Gargi and Leon. She is spunky and he is charming. Their story of romance isn’t mushy, or filled with false conflict and tension. Their attraction is impressive, also is their struggles. Another beautiful Christian love story with an intriguing and thought provoking plot! As I was reading this wonderful book, I thought this was a A captivating read. Some readers who has grown up among Indian culture will think that Parker J. Cole did a wonderful job making the smell and taste of Indian Cuisine come alive to her audience. I was hungry after reading about the different kind of dishes from the Indian cultures. Also she did a wonderful task of conveying the language and customs of Indian culture. The Book Cover and title caught my attention immediately. Once I start reading the first page of this book, I didn’t want to put the book down. The plot had many twists and turns to keep the readers speculating what would happen next, and the revelation about Dev in the end, while it didn’t come as a complete surprise, left me angry. I felt bad for Gargi because she sacrifice her happiness and life to try to prove that her brother wasn’t guilty. Personally I lost respect for Dev Kapoor for not only lied to Gargi but didn’t want to take responsibility for his actions. Since this is a Christian novel, I expected the heroine’s love interest would also be a Christian as she is, but it doesn’t seem clear that Leon is, and it didn’t seem to matter to Gargi whether he was Christian or not. The life lessons for us that our wrongdoings will caused damages to many that we loved and care for. Integrity is very important not only in our spiritual walk but also in our personal and professional walk of life. I am looking forward to read more stories in The Michigan Sweet Romance Series. This will make a wonderful Christian Romance movie.